Nothing is ever perfect, nor do things work perfectly all the time. When things go wrong with your computer, sometimes it’s something very simple that will only take a few minutes or one or two steps to correct. Other times, you aren’t so lucky and that’s when you have to bring out the right tools to find out what’s wrong with your computer. On the Mac you have Disk Utility or you can utilize applications developed by other companies, such as Disk Warrior or Tech Tool. Among the latter is also Prosoft’s Drive Genius 3, another tool that you might want to consider adding to your utility toolbox to help you out when things go bad. Prosoft’s Drive Genius 3 is their updated 64-bit application that allows you to monitor the health and well-being of your Mac. An updated user interface allows you to select Information, displaying complete information on your Mac’s hard drives and volumes; Defrag, letting you optimize your hard drive for best performance; Drive Slim, permitting you to recover space on your hard drive by removing unused or duplicate file and more; Repair, which allows you to verify, repair or rebuild your directory and to keep an eye on your system; Scan, which checks every byte on your drive for any errors; plus Drive Pulse, allowing you to monitor your volumes and hard drives in the background, monitoring reliability and performance. Realistically, you are talking on the spot, around the clock system health monitoring, much like being in a medical facility that has you on a monitor, watching for problems to correct them before they become more serious. As with most other items, Mac-related, Drive Genius 3 requires Mac OS X, version 10.5.3 or later, an Intel processor and 512MB of RAM to work with your Mac. When I received my copy of Drive Genius 3, I installed it on my MacBook running 10.6 and checked for updates, which updated the software to version 3.0.1. Backing up my MacBook’s hard drive, I can now check on the status of my Mac by either running Drive Genius from the backup or by utilizing the bootable DVD that comes with the package. When I first ran Drive Genius, I ran the Information portion, quick and easy. Then I ran the Scan portion, just to see if it would find anything on the 500GB hard drive I had installed in my MacBook several months earlier. Just shy of 3 hours, Drive Genius advised that there were no issues. I then ran Repair, looking to see if anything turned up; no problems, good to go. Then I ran Defrag. Yes, I know that with OS X there is not really a deep need for defragging a hard drive, but old habits are hard to break. In earlier versions of the Mac OS and on the older Macs that I used, I would normally defrag the hard drive every few months, just to keep things tuned up. Besides these functions, Drive Genius can conduct an Integrity Check, doing long term integrity tests; Initialize your hard drive, Repartition your hard drive without re-initializing by Shrinking, Expanding, Adding or Deleting volumes; Duplicate your hard drive, making a clone to another hard drive or copy a drive to a new disk image file; Shred files, folders and hard drives by overwriting data; and even BenchTest your system. Now, with Drive Genius 3, if things are taking a while and you have other things to do, you can set it up to send you an email notification when a time-intensive task is finally complete. So no more sitting in front of the computer, waiting for things to finish up. Now you can mow the lawn, shovel snow or take time to play with the kids while your Mac is being checked out. My MacBook is monitored as I use it, and if something were to go wrong, I know that Drive Genius is there to help correct the problem. 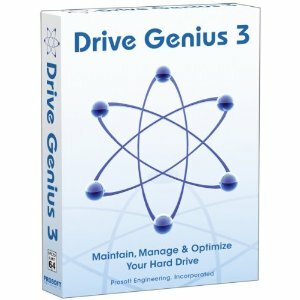 All in all, I give Drive Genius 3 a My Mac rating of 8 out of a possible 10. Sounds fabulous, why did you decide not to give it the other 2 stars? Issues or is it just that nothing is ever perfect? I didn’t get the opportunity to try out RAID support and because it is Intel-unit specific and I couldn’t try it out on my PowerPC Mac (yes, there are still tons of us with good old PowerPC’s) I gave it the best rating based upon what I could try out. And there are very few things that I’ve found could be rated at a 10 so when they do all they say they can and I can give it a good workout and it comes through with flying colors, then you’ll see 10s from me.